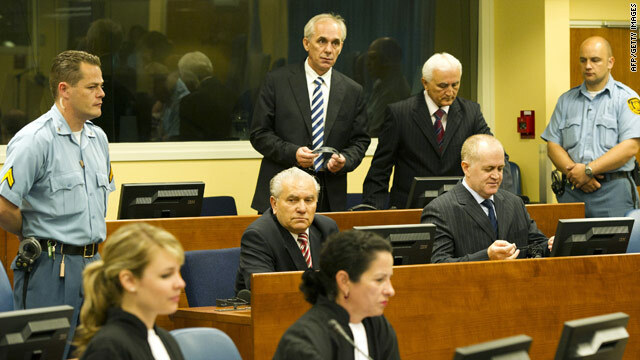 Four of the defendents -- Milan Gvero, Vinko Pandurevic, Ljubomir Borovcanin and Radivoje Miletic -- at the war crimes tribunal. (CNN) -- Seven former high-ranking Bosnian Serb military and police officials were convicted Thursday for their roles in the notorious 1995 Srebrenica massacre, the war crimes tribunal in The Hague said. The men were found guilty of a range of crimes including genocide, extermination, murder, and persecution, according to the International Criminal Tribunal for the former Yugoslavia (ICTY). The trial was the largest one to date held at the tribunal, the ICTY said. More than 7,000 Muslim men and boys were killed in the Bosnian town of Srebrenica in 1995 when ethnic Serb troops overran a United Nations safe area. The five-day slaughter was the worst European massacre since World War II and was described by the U.N. War Crimes Tribunal as "the triumph of evil." The Serbian Parliament officially condemned the massacre in March. The ICTY found Vujadin Popovic, chief of security of the Drina Corps of the Bosnian Serb Army, and Ljublisa Beara, chief of security in the army's main staff, guilty of genocide, extermination, murder, and persecution over the genocide and sentenced both of them to life in prison. Drago Nikolic, chief of security in the Zvornik Brigade, was found guilty of aiding and abetting genocide, extermination, murder, and persecution and sentenced to 35 years in prison. Ljubomir Borovcanin, deputy commander of the Special Police Brigade of the police forces, was convicted of aiding and abetting extermination, murder, persecution, and forcible transfer. As a superior, he was also convicted of murder as a crime against humanity and as a violation of the laws of customs of war, and sentenced to 17 years in prison. Radivoje Miletic, the chief of administration for operations and training at the main army staff, was found guilty of murder by majority, persecution, and inhumane acts, specifically forcible transfer. He was sentenced to 19 years in prison. Milan Gvero, assistant commander for Moral, Legal and Religious Affairs of the main army staff, was found guilty of persecution and inhumane acts and sentenced to five years in prison. He was acquitted of one count of murder and one of deportation. Vinko Pandurevic, commander of the Zvornik Brigade, was found guilty of aiding and abetting murder, persecution and inhumane acts and sentenced to 13 years in prison. He was acquitted of charges of genocide, extermination and deportation. The trial opened in August 2009 and ended in September last year. The court head from 315 witnesses and examined 5,383 exhibits. The court found the attack began with an order from former Bosnian Serb leader Radovan Karadzic to the army's Drina Corps to create "an unbearable situation of total insecurity with no hope of further survival or life for the inhabitants of Srebrenica and Zepa," the court found. At least 5,336 identified people were killed in the executions following the fall of Srebrenica, the court found, but it said the number could be as high as 7,826 considering the lack of evidence about the killings. "The scale and nature of the murder operation, with the staggering number of killings, the systematic and organized manner in which it was carried out, the targeting and relentless pursuit of the victims, and the plain intention -- apparent from the evidence -- to eliminate every Bosnian Muslim male who was captured or surrendered proves beyond reasonable doubt that this was genocide," the trial chamber found. "In the context of the war in the former Yugoslavia, and in the context of human history, these events are arrestive in their scale and brutality." Popovic was found to be one of the major participants in the massacre, the court said. He was present at a number of sites where captured Bosnian Muslims were detained or executed between July 13 and 23, 1995, the court said. "Popovic knew that the intent was not just to kill those who had fallen into the hands of the Bosnian Serb forces, but to kill as many as possible with the aim of destroying the group," the court said. Beara was the "driving force behind the murder enterprise," the court found. He made personal visits to the various detention and execution sites and "had a very personal view of the staggering number of victims destined for execution." Borovcanin was not aware of the murder plans in advance, the court found, but he failed to try to stop them once he became aware. Borovcanin was also present at a warehouse where he saw more than 1,000 Bosnian Muslim men detained and a busload of dead bodies out front, the court said. "After seeing the evidence of executions, Borovcanin removed himself and his men from the ... warehouse as quickly as he could," the court said. "The chamber found that Borovcanin had the means to protect the remaining prisoners and knew that it was probable that the prisoners would be killed. His failure to protect them substantially contributed to the full-scale execution which later took place." Pandurevic actually opened a corridor on July 16 to allow a column of Bosnian Muslims to move to an area held by Bosnian Muslim forces, contrary to orders he had received, the court said. After the corridor was closed, Pandurevic's men found 10 wounded Bosnian Muslims who were then taken to a hospital, in Pandurevic's custody, the court said. Pandurevic was told that Popovic would come to take the 10 wounded men, and they were later killed. The court found Pandurevic did not possess the intent to murder to the 10 men, but that he knew it was "probable" they would be killed once they were transferred into Popovic's custody. "By failing to intervene, Pandurevic failed to discharge his legal duty to protect the wounded prisoners and therefore substantially contributed to the murder of these 10 men," the court found. A total of 21 people have been indicted for crimes committed in Srebrenica, the court said. Karadzic and three others are currently on trial. Ratko Mladic, the wartime leader of the Bosnian Serb Army, has been charged with genocide and remains a fugitive.